Toolroom Records delivers one of their most highly anticipated releases to date as Mark Knight hooks up with Skunk Anansie’s lead vocalist, Skin, on their huge collaboration, ‘Nothing Matters’. The release comes complete with remixes from Tensnake, CaPa and Noisia. 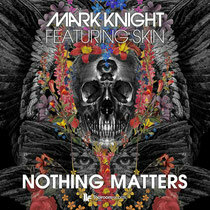 ‘Nothing Matters’ further cements Grammy-nominated artist Mark Knight’s production prowess within electronic music as this is a huge track with massive crossover appeal, one that should translate from deck sets to stadium-esque live performances thanks to the haunting vocals of Skin. On the remix front, drum and bass superstars Noisia turn in a powerful 172 BPM bass-blowing rework that will shake the subs in all reputable clubs. New Toolroom signing, CaPa, takes things on a big room progressive tip, while Tensnake stamps his chunky disco house sound to complete the remixes. Check its fresh new video and have a listen to it below, it’s out 23rd July. After checking out a number of the articles on your site, I truly like your technique of blogging. I saved as a favorite it to my bookmark website list and will be checking back in the near future. Please visit my web site as well and let me know what you think.